​The Top Hardwood Floor Refinishing Company on the South Shore Welcomes You. 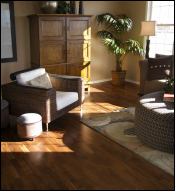 Plymouth Floor Refinishing is your expert for any and everything wood flooring. Floor refinishing, restoration, sanding, staining, and rejuvenation. Aside from our services, we also pride ourselves on being the ones who deliver the highest level of customer service. As we take you through the process of hardwood floor refinishing from the beginning stages to the entire lifespan of your hardwood floors, we constantly strive to work on your terms, and your deadlines. We know that there is obviously a high demand for beautifully finished hardwood flooring these days. Everyone loves not only it’s durability but it’s aesthetic nature, modern feel and the ultimate feeling they get when they walk into a room and become entranced by the shine of the room (which of course is dominated by the elegance of hardwood floors). This is why we are here to keep it looking amazing, we are always going to be that company that knows how to keep a good looking floor looking great. Not only do we just refinish, we put your old floors through an entire makeover, and at the end you will be left with an amazing looking floor just from going through our services we provide. We are very proud to offer a wide variety of many kinds of finishes to choose from, and different methods to refurbish your old worn out floors. Give us a chance to show you why we are the number one floor refinisher in South Shore! As stated previously our many services include floor refinishing, restoration, sanding, staining, and repair. We always pride ourselves on being able to work with your schedule and your budget, not ours. We always put our customer first and we always work hard to not only earn your business, we want to work even harder to give you the hardwood floors of your dreams. As far as workmanship, craftsmanship, prices, customer service, and efficiency go we are by far The Number One Floor Refinishing Company to call. Floor Refinishing in Plymouth adds a ton of great value to your home. We know that when you decide you want to make an investment to turn your house into the home of your dreams, you expect to see a return on that investment. So when we meet with you to design the process of making your old floor new again, you can sleep easy at night knowing that all you invested into it will substantially pay off down the road. Your house’s value (in your eyes and in the eyes of the real estate market) will start going through the roof now that you have that incredible shine to your interior. We Also Do Any Kind of Hardwood Finish You Can Think Of! Obviously we have to offer you more than one type of finish to choose from! Among our types of hardwood finishes here at Plymouth Floor Refinishing we have; Oil-modified urethane, Moisture-cured urethane, Water-based urethane, Penetrating Sealers, Varnish and Lacquer just to name a few! We always take the time to show you all of our options as well as guide you step by step through our process so you will never feel like you are lost or misunderstood. Our finishes are all locally sourced except for the cases where we must special order in any international brands out of custom orders. Most of our clients love the look of our Oil based polyurethane finishStaining simply because it adds a sparkle to the floor at one of the more cost efficient price points. These Oil-based polys are the mainstay of floor finishing and widely used by most professional finishers across the board. Although they are certainly tough, long-lasting, and less-expensive than water-based polys, these finishes have a higher VOC content and stronger odor during application (unless you’re one of those people who like that smell?) A coat takes 8 to 10 hours to dry, so you’ll want to vacate your house until the floor is completely dry! Even though this is one of our most popular options, it is also just one of many. Moisture-Cured Urethane – This is one of the most durable finishes that you can get on the market today. It is quite a step up in toughness and longevity from water- and oil-based polyurethane. It’s tricky to apply and isn’t recommended if you are trying to do it yourself, however it dries very fast, so you won’t have to wait long before you can enjoy it! Water-Based Polyurethane – Polyurethanes are today’s go to floor finish. These water-based varieties used to have (somewhat of) a reputation for being eco-friendly (still true) but not as durable as other regular polys. However, today’s modern use water-based polys are pretty darn close to being as tough as their oil-based cousins. The only other final difference between these and oil based is color, water-based polys dry clear; oil-based polys have a slight amber tint. Acid-Cured (Swedish) Finish – Now this if the Cadillac of floor finishes by far, these should definitely be left to the pros at Plymouth Floor Refinishing. They’re among the toughest of all hardwood flooring finishes all the while being the most expensive as well. (They’re sometimes called conversion varnish sealers.) The only down side is that they tend to linger for awhile so you may have to spend a little extra time out of the house before you get to enjoy all of it. We are always with you every step of the way! We know that everyone likes to shop around for services before committing to anyone. We do the same thing in our personal and family life. We are happy to give you an estimate on your floor refinishing project; mainly because we are very confident in our pricing and the quality of our work. Whatever option you decide will fit you and your family’s best needs; we will always be there for you to consult and to guide you through the process. After all there is a reason that we are The Best Floor Refinishing Company in Plymouth. And if you are in need of an area carpet or rug to enhance your beautiful wood floors, check out our friends at Boston Carpet Clean. Now the next step is simple. Give us a call! Or get in contact with us any way; we have email, phone, or a quick quote form that you can fill out right here on the website. The only thing that matters is that you give us a shot to prove to you why we are the fastest growing Floor Refinishing Company in South Shore! So what are you waiting for? Give us a call today!